The facts are out, the reviewers have held the controller in their hands and the word is it is comfortable. Seriously the controller is 6.9 inches wide, by 10.5 inches long, easily knocking the original Xbox Fatty controller as biggest launch controller, yet most are reporting it fits well in their hands. Taking up most of the space is the 6 inch touch screen everyone is talking about, bookended by a pair of analogue nubs, shoulder buttons, a D-pad, and four face buttons. The controller also comes with a stylus, a sensor strip, built in stereo speakers, an infra-red sensor, rumble feature, microphone, camera, AC adapter port and headphone jack. 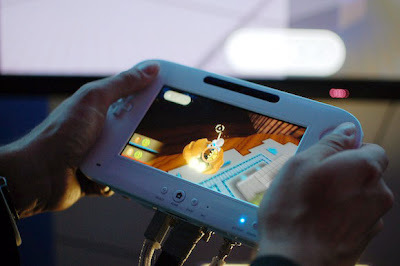 One thing that the Nintendo officials have had to clear up; this controller is not a portable gaming device. The controller will not be sold stand alone and will only be bundled with the Wii U console itself. While it is wireless, the streaming distance will not allow for much traveling and playing. Expect to stay on your couch as much as the last console generation. One thing is that with the new screened controller, having a TV isn't necessary to play on the Wii U. That's right, you can turn your system on and play right on your big screened controller. 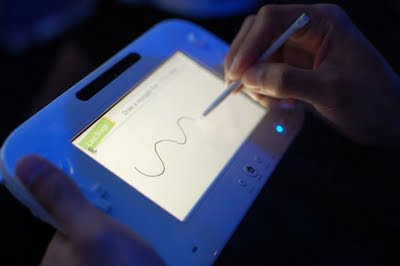 Another detail cleared up; The Wii U will support one new touch screen controller, and up to four Wii motes. This is interesting since it hints at having five players taking part in upcoming Wii U games. Think about it breaking away from the traditional four player modes, having four people on the TV screen and the fifth on their screened controller. It is unclear if it is even possible to sync up more than one screened controller to a Wii U at a time though. This can be considered good news because as cool as a screened controller is, having to pay out the price tag of $100 to $250 a controller would be a bank breaker for most. The Wii U will be fully backwards compatible will all previous Wii titles and gear, which is something Nintendo's competitors have not followed suit with. The Wii U has been hinted at selling for about $250, though this is not set yet, it is still good to hear that the price will be near the original price of the Wii. Nintendo will once again bring in the casual and the money conscious gamer with a lower price tag. While I am excited to see Nintendo again leading the way with new technology and innovation, I am wary to see how they use this new technology. Often with Nintendo we dream too big and we end up disappointed in the final execution of their product. Next post I'll be discussing how this technology can be used in future games, and where I hope it will eventually evolve to.